All successful businesses have one thing in common: relevance. In a recent study from Accenture, a global management consulting and professional services firm, 65 percent of the 23,000 consumer respondents said that, when they switched company brands, it was to pursue more relevant offerings. If you own a thriving business, it’s a fact: You have done something to keep your product or service pertinent to the world around you. So, if you’re in business, how do you do that? How do you remain relevant? In the long term, of course, you should keep up-to-date on general technologies affecting your work and you should stay on top of continuing education. But let’s look at the short term: Each week, there’s some small thing you can do to make sure your brand is out there working for you. * Blog: You know your business – and what you know could help others, including potential clients and customers. Share what’s new in your trade or some other knowledge you have that others might not. Maintaining a blog is a great way to give back through sharing; it’s also a natural way to keep your name current and to keep your website updated. An outdated website is a clear sign to the public that you are not keeping up. * Networking: There’s no substitute for face-to-face connection with the world out there – and with your professional public. Join your local chamber of commerce. Explore service and professional groups in your area that are likely to connect you with new clients, customers and consumers. Attend community gatherings. Doing this even once or twice a month can do wonders for your professional visibility. * Traditional media: There’s also no substitute for positive press, for a good-news story. So, what have you got? Can you speak or share a presentation at a civic group meeting? Can you find a way to give back to your community in some unique way? Or how about offering a free introductory service or leading a free introductory class? … The options are pretty vast, to do something that will make the local news – online, in print, on radio and on TV. With the help of a marketing or public relations firm, you can make a wonderful name for yourself, locally and sometimes beyond, by simply doing something good. Some of our greatest success stories at The Goddard Company have revolved around media campaigns that have catapulted good businesses into the stratosphere, simply by shedding positive light on them in the public eye. Uh oh. ... Just hearing those words can spark a low-level anxiety – and not just because you still haven’t bought your sweetie a gift, or because you don’t have a sweetie (you’re not alone). What can be especially jarring about this particular holiday is that it means a full month and a half has already passed since the new year. But guess what? It’s not too late. Far from it. There are ways you can still hit all your marketing goals and accomplish what you set out to accomplish just six weeks ago. First of all, keep your eye on the prize. Literally, pull out that list you wrote down with all your goals and commitments for this year and read them over again. Perhaps they’ll spark something different in you today. Some goals may no long seem necessary or realistic. Some may feel even more important now. Just taking the time to read over your resolutions may well light the fire you felt when you first wrote them down. Ask for help. Reach out to your co-workers, employees, business associates or networking groups and find ways to collaborate. Check in with your marketing or publicity team and see how they can assist you in meeting your goals – and how you can help them in theirs. Just see how much a team can accomplish. Take note of what HAS been done. Did you write a blog last month? 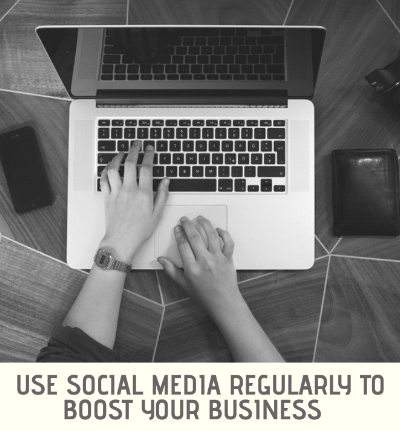 Did you stick to your commitment to post on your social media more consistently? Give yourself credit for what you HAVE accomplished over the past six weeks and let that pride compel you. Break it down. Instead of focusing on the whole year, take a realistic look at what you can do this month, this week or even this hour to keep the overall plan in motion. Finally, think big picture. You may have called them New Year’s resolutions, but the business goals you set for yourself in January do not necessarily end in December. Don’t judge yourself by your actions each day; have the foresight and vision to see where your long-term goals can ultimately lead you and your business. In 1982, seven people in the Chicago area died after taking Tylenol capsules laced with poison. It was headline news for weeks. In response, Tylenol’s parent company, Johnson & Johnson, directed by its public relations team, immediately pulled more than 30 million bottles of Tylenol, stopped all production and cooperated fully with law enforcement. When the crisis had subsided, the company reintroduced Tylenol in then-new and highly innovative tamper-resistant bottles, along with $2.50-off coupons. The company is widely credited with leading the way in unsafe packaging reform. This landmark case presents a perfect example of how to manage a PR crisis. Proof is in the fact that Tylenol exists today as one of our nation’s primary pain-relief products. We may not be at the level of Johnson & Johnson, but let’s face it, in all of our lives and businesses, crises will occur. How we respond to crisis can be the difference between a tragic ending and a happy ending. Each crisis is unique – connected only by the common element of surprise – and so is each resolution plan, but when any crisis occurs, the need to respond and communicate is immediate; the method of response is critical; and the existence of a crisis communication plan is vital. If you don’t have one, you should create one or connect with a public relations firm that can help. About two years ago, we defined what free media is here, but now we’d like to dive deep into what free media really, REALLY means. Free media. How many business owners out there have wanted to promote their companies but could not decide between advertising or publicity – aka free media? The best way to describe free media is to compare it to its counterpart – advertising, which involves a person or company paying a newspaper (or radio station or cable TV channel) to have an awesome product or service put on display for the world to see (or hear). Of course, there’s nothing wrong with advertising, and it can be an effective way establish “name recognition.” But there is an unattractive connotation with the idea. Think about it: When we see an ad on Instagram, we swipe quickly past, and when a jingle for dog food comes on the radio, we groan and change the channel. Free media is different. There is no payment for a spot in a magazine, only persuasion for one. Our job as public relations agents is to convince journalists and editors why our stories matter, so when our articles are published, they are endorsed by the print media, not paid to be there. This third-party validation is everything. If Fred the Barber pays for an ad in the newspaper, he doesn’t cut it out, frame it and show all his customers. But if Fred the Barber is nominated and wins Barber of the Year in the Los Angeles Times, you can bet that recognition will be on his wall. As a result, publicity is usually more “bang for your buck.” Not only is the press that’s generated by PR agents free (meaning no one pays publications for it to appear) but it is meaningful. So, turn down that radio ad and swipe away on Instagram and, the next time you’re faced with the age-old marketing dilemma of “To Advertise or Not to Advertise,” consider free media as a more effective way to boost your company’s presence. Interested in speaking with free media experts? Call us and we will answer any of your PR questions. On June 28, the World Business Academy hosted our second panel discussion about revitalizing State Street and Downtown Santa Barbara and the meeting yielded some very good news: Amy Cooper, owner of the Plum Goods store on State Street, announced she will head a new Santa Barbara Retail Task Force to help lead the revitalization effort. The World Business Academy remains dedicated to giving leadership and help with this effort. But let’s be clear: this is a COMMUNITY issue and the community needs to be a part of the solution! Our latest meeting at the Belmond El Encanto resort, which was attended by over 100 people and covered heavily in the local media, was the second time in recent months that we have gathered retail representatives, thought leaders and city development experts to discuss how to stop State Street from dying on the vine. No one in Santa Barbara can deny that something has to be done to breathe new life into the retail sector in Santa Barbara and particularly State Street. The State Street retail community has been hammered by recent local natural disasters, compounding the impact of e-commerce, neighborhood vacancies, difficult local regulations, aggressive panhandlers and high rents. At the recent meeting, the infusion of fresh ideas from Jerry Ogburn, a downtown development advisor for the city of Palm Springs, provided wholesome food for thought. Ogburn shared his experiences in Palm Springs, which has successfully reinvented itself in recent years and is no longer seen as a city just for the elderly (“God’s waiting room”). Ogburn noted that more millennials, new downtown housing, additional street lighting, added outdoor dining and a vibrant gay community have all given Palm Springs new life; maybe they would help Santa Barbara’s Downtown, too. A Downtown park would be nice also, Ogburn added. He said Palm Springs attracts thousands of locals, millennials, families and tourists alike with its lively weekly Village Fest held on Thursday nights, where live entertainment, craft booths, shopping and food bring the community to the downtown for a night of fun for everyone. Why isn’t Santa Barbara doing something like this? Rinaldo S. Brutoco led the June 28 discussion that also included Amy Cooper; former Santa Barbara Mayor Hal Conklin, now president of USA Green Communities; and Ron Fox, a board member for People Assisting the Homeless. Fox rightfully noted that the solution to moving homeless folks off of State Street is finding them somewhere to live, and while that’s difficult, at least the homeless problem Downtown could be mitigated. If Santa Barbarans want to rescue Downtown from becoming obsolete and help remake the area into a destination where locals and tourists flock, then we all have to join the effort. Read our blog and watch for our news in the local media as this effort and the workings of the new task force move forward. We hope everyone in the community pays attention and joins this important effort to make our city a vibrant destination that everyone can enjoy. Textured Coatings of America’s products have covered some of the largest structures on Earth ─ from massive bridges to towering buildings ─ but it was its coverage of a simple sign on a hill that truly put the company on the map. It didn’t hurt that the sign says “HOLLYWOOD” and is one of the most photographed and iconic symbols in the country. The Hollywood sign may be a relatively small surface, but this was a big job. The decision to cover it – for free – came from TCA President/CEO Stuart Haines, whose multinational, world-class company has its roots in Los Angeles, where it was founded in 1961. In the mid-1980s, Haines decided to repay his hometown with a unique, generous and much-appreciated gift to the city. Working with the Hollywood Chamber of Commerce, Haines arranged for TCA to donate the supplies and the labor force – including reformed L.A. gang members – to repaint the Hollywood sign’s 50-foot-high letters and coat them with TCA’s patented TEX•COTE Graffiti-Guard®, to protect the iconic landmark from vandalism. The project cost TCA more than $25,000 and took a week to complete. The immediate accolades came straight from City Hall. 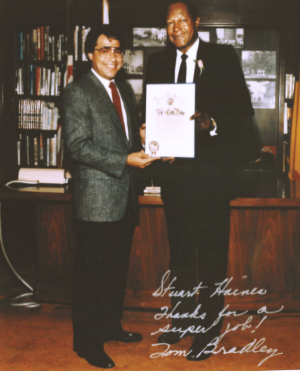 In response and in gratitude, then-L.A. Mayor Tom Bradley proclaimed Aug. 1, 1985, to be TEX•COTE Day in L.A.; Bradley further created The Mayor’s Committee for Graffiti Removal and named Haines to chair the committee. TCA’s generous gift also generated a media storm that included widespread public and broadcast recognition and countless articles in publications across the country and around the globe. The now-57-year-old company may already have been on track for long-term success, but the creation of that inspiring, indelible moment of random kindness catapulted it. From that moment on, TCA could rightly present itself as a celebrated, world-renowned corporation. The moral of TCA’s sign story is classic Hollywood: A simple kind act can reap invaluable rewards. We exercise, eat right and visit the doctor to keep ourselves healthy, and we spend time with our family and friends to keep ourselves happy. But what about our business relationships? Without proper maintenance, our work alliances can grow feeble like any other relationship. Without care, they can become unhappy – and unsuccessful. But there are simple steps you can take to keep your professional bonds healthy and thriving. 1. Communicate. As it is in other life relationships, communication is vital in a business partnership. And like in any strong relationship, the best communication is honest and transparent. Be truthful always. It might be scary to let a client or other work partner know exactly how you feel (for example, if a certain deadline might not work for you), but it is far better than faking it and then potentially letting a person down. Be honest from the start. When you prepare a work outline, make sure your plans are clear and concise. In PR specifically, running all publications by your client before any media distribution is an absolute must. Your work together is a collaborative effort. If your client doesn’t approve, you don’t publish. 2. Meet deadlines. Always create manageable deadlines, and strictly adhere to them. Big or small, influential or fledgling, every client and co-worker deserves that respect. Every one is your No. 1 priority. Treat them like it. Present your best work in the agreed-upon time frame. 3. Don’t over-promise. It’s common for people to zealously oversell themselves in business situations and make promises they cannot keep. We’re all eager to land proposals, and sometimes our default is to offer more than we can reasonably do or give. But the foundation for a happy business partnership is setting attainable goals and creating realistic expectations. 4. Never stop learning. You don’t need to be an expert in every field, but you should be familiar with your clients and associates and with their milieus and markets. In PR, for example, if you’re helping a widget-maker sell his new Widget 2.0, you’ll want to bone up on the widget industry and then figure out what makes this new version stand out. Also, of course, know your audience. What’s your client’s target demographic? What’s the geographical market? The more you can put things in human terms, the greater your chance of success. 5. Ask for feedback. Are your clients happy with your services? Could you improve in one area or another? Some clients might hesitate to mention something until the question is brought to them. The answers might not always be fun, but they can strengthen your relationship as well as your business. Not only does this help you know your areas of growth, it demonstrates to your clients that you value their opinions. 65.2 million people in the United States alone listen to the radio each day. Why is it then, lately, the attitude toward radio is that it’s a thing of the past? Too many people view the radio like a pager or VHS player, both having been replaced by newer, more advanced technologies. Looking at the statistics, however, one will find it is in fact the leading reach platform. For people around the world, radio is available. Despite location or socioeconomic status, countries that go without Internet or cable are more likely to have radio. Amid disaster, radio is often the only line of communication and source of updates on the status of a situation when all phone lines, cable and electricity are gone. Moreover, online radio or podcasts have also brought traditional radio to an even larger demographic, increasing from 12% of Americans listening to 53% over the course of the past five years. One can tune it at anytime to find out what he or she has missed. While watching TV, one can fast forward or pause, going straight to his or her desired viewing. The difference with radio is that many will turn on the radio to discover something new whether it be a song or a quick happening on the news. On the radio, people may hear a news update or a blerp of a talk show and get hooked! In a matter of minutes, they have learned about a new world or local event or company that they must further investigate! Moreover, radio is on in cars, buses, and offices, each place becoming a marketing opportunity. In PR, radio is essential to spreading awareness about a client’s news. Much of the time we will work to find an available time slot for our clients to share about their accomplishments or new product. This is a prime opportunity for them to share their skills with the community and ultimately attract more business! The other night I met with friends for dinner and one of the women would not stop gushing about how much she loved her new face scrub. It made her face so soft and her skin was never going to be the same and the website she ordered from was so easy to use and even sent samples of other products for free! What did I do the second I walked through my door? I went to my computer and ordered it. Referrals are key to promoting any business. It’s all about the client experience. If location permits, get to know your client over coffee. A face-to-face meeting is much more personable and shows the client you are available and care. Then, make it a point to answer their calls and personally return them if missed. If you can, have direct interactions between you and your client rather than handing them off to your assistant or secretary. When you haven’t heard from the client in some time, send a summary email of your recent work for them and perhaps some ideas for future projects. Join groups and attend events! Get involved in the Rotary Club in your area or join ProVisors. Become an asset to your community. The more people you meet, the more referrals! You have the referral. Now what? Make sure to follow up. They’ve already heard about how wonderful you are. It’s why they reached out! Now give them their first taste of your talent by being a step ahead of the game. Send them a sample of your work before your first meeting. After your meeting, take the time to write an email to them thanking them for meeting with you and reminding them you are happy to answer any lingering questions. This also provides a great opportunity to lock down the next time you are going to meet or speak with them. If your client is looking for a service outside of your area of expertise and you know the perfect person or company for the job, refer them! This not only adds to your credibility but also strengthens the relationship between you and your connection/source. Perhaps somewhere down the line your connection will return the favor, especially if you make sure to thank them. This can be done with a phone call and then later by following up with a handwritten thank you note. How do you feel about public speaking? Great? Fine? It’s not your favorite? If you can bear it, do it! Are you convinced but the thought of speaking in front of people still makes you nervous? You’ll do great! Just follow these tips to become a more confident, effective public speaker. Prepare. This may sound obvious, but I cannot stress this enough. Know your presentation backwards and forwards. To help strengthen your muscle memory, do extra research and look over diagrams. Or, the next time you are speaking to a colleague, bring up your topics in conversation to grow more familiar. Feel like you have it down? Practice again! When the adrenaline kicks in you cannot be too familiar with your presentation. Watch and listen to yourself. Look in the mirror. Do you look anxious? Do you look like you’re thinking too hard about what you’re saying? Smooth out those thinking lines on your forehead and add a smile. It will go a long way. Then, record yourself. By listening to yourself ahead of time you can correct your verbal short comings. Practice that long awkward word and industry vocabulary. Make sure you vary the inflection in your voice and avoid maintaining the same vocal rhythm or tone or you will be sure to lose your audience’s attention. Remember to KISS. As the old but valuable cliché goes: Keep It Simple Stupid! Some in your audiences will not have a college degree and/or lifetime experience in the field. Therefore, they do not need, want or care about the intricate details of how your business works. You will put them to sleep or overwhelm them, causing them to absorb next to nothing. Rather, share the big picture and interesting, select statistics to convey your main points and demonstrate how invaluable you are. Connect with your audience. Make sure your listeners are engaged. Scan the room from time to time, making eye contact with different members of your audience. In addition, look for people nodding, smiling, or taking notes. If everyone looks like they’re dozing off or texting, it’s time to switch up your approach! 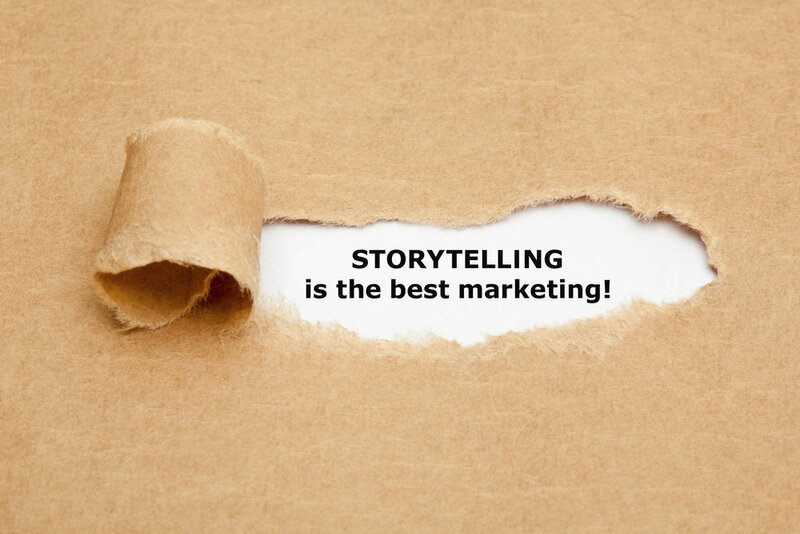 Personal anecdotes can also make your message more memorable and enjoyable and make you more relatable. Now, go out there with confidence and show society that you a valuable community member with worthwhile skills to share! In 2018, I am going to work out five times a week and never eat chocolate and read a recreational book every night before bed . . . If only! How often do we make these New Year’s resolutions and watch them slip away within days or, if we’re lucky, months? 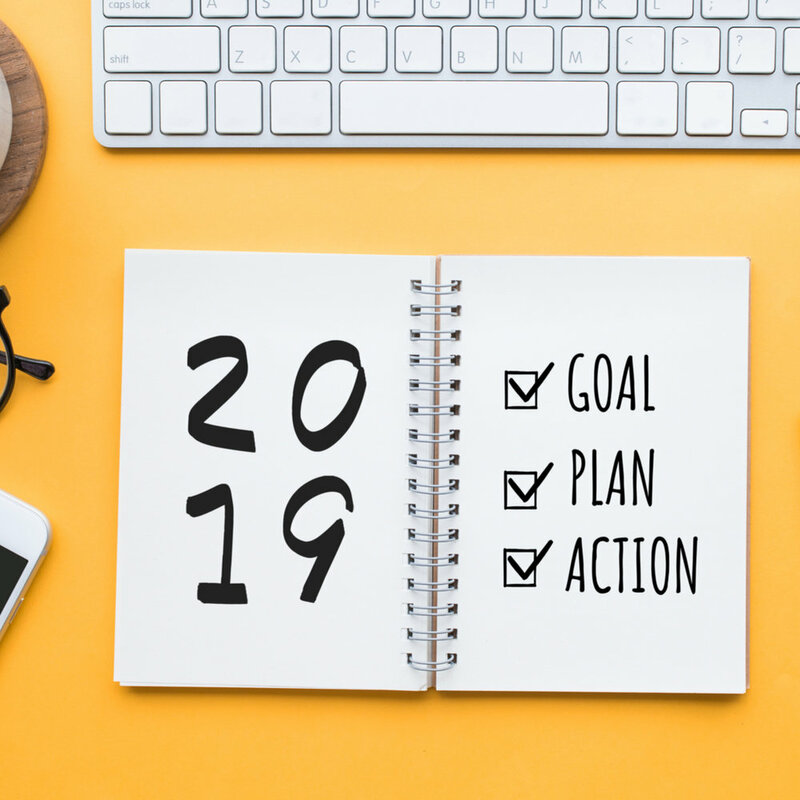 While much of the time these resolutions are farfetched, these following six tips are 100 percent doable and will set your business up for a more profitable new year. Write and send press releases. Keep your business in the public’s eye. The more press releases you write the more you will be published. The more publicity your company receives the more business you will have. Who doesn’t want that?! Schedule public speaking engagements. Showcase your vast knowledge about your field, or speak about one of your hobbies, connecting with audiences on a personal level. Attend events. These are networking opportunities! Make connections with other people in your field and potential clients. Organize your office. A cleaner work area is more inviting to others and promotes clear thinking. Blog. What better way is there to display your wealth of knowledge? Give people a taste of what you can do, and they are sure to come running! Cleanup your social media image. New year, new you. Or at least new image. Delete poorly written articles on your company website, update your expansive bio and refocus on your target clients. During the holidays, our time overflows with gift buying and wrapping, holiday parties, family and friends and the revolving door of welcome and not so welcome guests. Our time and focus are split. Therefore, many competitors are “gone skiing,” so to speak, while potential clients are accessing the same material and sites as the rest of the year. This presents you with the perfect opportunity to end your year with a bang. Follow these tips and you’re sure to find more success and cheer this holiday season. Don’t stop. The media is scavenging for stories, and now is the time when you may get a story published that may have been normally overlooked. Write an end of the year summary. Review the year with your bookkeeper and a few clients about the year. How did you do financially? How did your clients feel about your performance this past year? Type it up and send it off to an industry trade publication. If you can’t beat them, join them. Our holidays are flooded with festivities. You can’t avoid them, and if you try, you’re either ignored or deemed a scrooge. Think about it. When you pass a shop front, what grabs your attention? Is it the everyday display sets or those with holiday decorations and lights? The same is true for your business. Create articles, images or blogs that embrace the season. Potential clients and the media will take notice and remember. Use social media. Always. Everyone wants some vacation time over the holidays, us PR people included. However, that does not mean that we can stop with our social media presence. Plan your posts, pictures and captions in advance, freeing up some time at the peak of the merriment. If you don’t want to be doing the posting manually, then schedule the release by investing in an app like Hootsuite or Spoutsocial that will do it automatically while you are making merry! Expect to have to follow up with people. Both clients and the media have untraditional schedules and other distractions due to different vacations or abnormal time away from the phone or computer. An extra phone call or reminder email will often help. Send out New Year’s cards from your business. This not only sets your card apart from the flood of Christmas cards but also reminds people that you are still there when they are looking to start the new year strong. When referring to percentages in a press release, blog or article, do you write out p-e-r-c-e-n-t-or use the % symbol? How do you refer to military personnel by title? What about state names and their abbreviations? Is the “Deep South” capitalized in an article or is it “deep south”? Why should you care, anyway? All of this and much, much more is covered in the Associated Press Stylebook, a must-have work tool for professionals in the public relations and media industries. We can’t live without it. It sets our standard for consistency and plain old good writing. Associated Press style, or more informally known as AP style, is most commonly used by most print journalists and public relations professionals. Birthed from the need to relay news of the Mexican-American War, the Associated Press was created as an independent news organization when six New York City newspapers combined resources, developing a more efficient way to spread news. The Associated Press has since gained momentum and is now the biggest news organization globally, with its news reports and articles read by people all over the world, every day. Through its success, the Associated Press has created its own style of writing that dominates published media. As editors, writers, and publishers each make their mark on a piece of work, AP style is essential to maintain consistency in writing. Guidelines for AP writing include capitalization, abbreviation, punctuation, spelling, and numerals. Such rules are made with the intent to ensure accuracy, neutrality, brevity, and clarity. The first AP style guide was published in 1977. As the language we use and our culture change over time, and new words and phrases are introduced into everyday dialogue and writing, the AP style grows and evolves too. After all, we didn’t have words like “Internet” in 1977. The AP adapts. Like fashion trends, correct names and ways to reference a group, person, place or thing continually change. Therefore, every so often AP guidelines are revised, and a new edition of the AP Stylebook is published annually in the spring. My advice to you? Pick up a copy of the latest Associated Press manual from Barnes and Noble or order it online. With the interest of specializing in published media, one needs a copy at hand or, at the very least, to be prepared to thoroughly Google the correct AP grammar and style use before publishing. Who was the wife of the 18th president? Don’t know? Google it. How often each day do we just google the answer for a nagging question? Nineteen years ago yesterday, two Stanford college students created Google in their dorm room. With the goal to organize the seemingly infinite information on the World Wide Web, creators Larry Page and Sergey Brin revolutionized the way the world accesses material. Initially attracting the attention in academic circles, Google is now used by millions of people everyday. Want a phone number or email of the editor of the city’s most influential newspaper? There’s no more need to rifle through the Yellow Pages or call the office and ask around in hopes of coming across a friendly receptionist. Instead, we Google it. Moreover, if you need to know demographic of an area of a client’s business, there is no need to conduct your own field research before beginning your media campaign. Simply Google it. Google’s influence in the media is undeniable. Each year Google has taken in more advertising dollars than American print media. This may be due to its discarding of stories from rival search engines and prioritizing its own material and paying customers. It may also be because almost 75 percent of the world uses it Google. Richard Gingas, Google director of News and Social Projects, depicted Google as a method “to connect the dots between a consumer’s interests and informational needs and the most relevant available knowledge from the best possible sources.” (1). All we as consumers need is a keyword in mind and Google does the rest, compiling all the most relevant and important sources for us. So, how can we freely attract publicity using Google? When it comes to social media, Google rather surprisingly states that it does not take into account a profile’s importance or influence. However, if you include links to a credible source in your posts, the links will then boost your search ranking within Google. In addition, when frequently searching brand names or companies, social media profiles are among the top results. Therefore, make yourself available on every social media platform you can properly and professionally maintain. Ensure that each profile is clean as it may very possibly be one of your respective client’s first impressions. Making an accurate profile description of your product or person, including keywords that people would use to search for you, is also crucial. Be sure to update your profile as well every few months, keeping it current. Google creates an opportunity for news and information to gain an amount of publicity that did not previously exist, so take advantage of it! Thank you, Google, and happy 19th birthday! (1) Jordan, Brooke. "Google's Impact on Journalism." UFSocial , 26 Oct. 2016. Accessed 27 Sept. 2017. (2) Ratcliff, Christopher. "What are the top 10 most popular search engines?." Search Engine Watch, 8 Aug. 2016. Accessed 27 Sept. 2017.